///EDIT/// I finally got the colors done on this one. Here is the previous version I posted, if any of you are curious. TCAF was the bomb. What a good time. I think my favorite part was that it was in a library and free. So it just felt very open and friendly. And the time in Toronto, I was entertained and shown around and taken care of by Brian and Don (of the lovely comic Road Apples Almanac). Good company. So…. I was hoping the spacetrawler book #2 would arrive in early-mid april, but they arrived right as I hit these two comic conventions, and so it’s been a bit of a cluter-f*@$ keeping on top of it all. And so with all that, I didn’t have enough time between Stumptown and TCAF to draw Monday’s and Wednesday’s strips. So I am posting abbreviated versions for now. Still and all, good show! Hope you enjoyed the conventions. Yes, TCAF (and all the peoples) was lovely. As for the half-finished comic, I quite like this sort of glance at the artist’s creative process. I just wondered: How long does such a panel take? Sketching … coloring … finishing? Could you sketch the whole process or did you already describe it somewhere? @Chris: Hey, that’s a pretty good idea! Maybe I should start telling people how many books I’ve plotted, “only” needing to fill the words in. I also wouldn’t be surprised if the Mihrgoots’ (sp?) 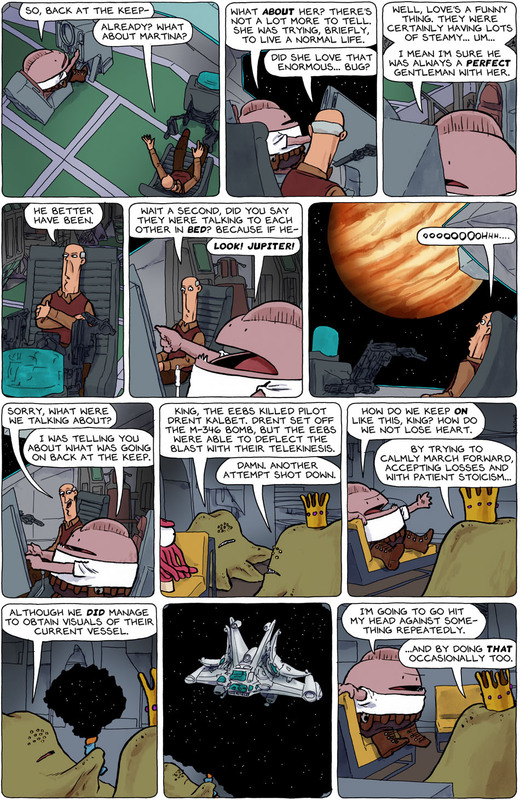 spacetrawlers were busy manufacturing stoicism pills. Good to meet you too, @Mark! I thought the same thing about Jupiter that @Frank did. “Ooooooo,” indeed. Cool to have a bit of a look at the process. Fun to check out the backgrounds. Jupiter is pretty awesome, isn’t it? I have to say that I like seeing the drawings. Gives me more insight somehow. OTOH, now I am confused about why the king’s fellow looks so much like Nogg sometimes. All will come clear eventually.